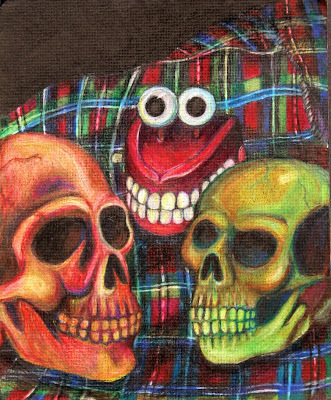 This is a still life I did in colored pencils. Yes, I have skulls just randomly lying around! This is a relatively small artwork with a huge amount of detail. It's a still life done on a textured piece of black matte board. I wanted show off my technical skills with colors and shading in colored pencils in this piece. The plaid was a real pain.. I didn't realize exactly what all went into that busy plaid pattern until I had to recreate it! Even so, I had a lot of fun doing it and it reflects in the quality of this piece. If you're interested in buying the original, contact me for a negotiation of price. Prints are also available here..